Tom's Restaurant is a diner owned and operated by a Greek-American family since the 1950s. It's at 2880 Broadway, on the northeast corner of its intersection with 112th Street. Suzanne Vega's 1987 song Tom's Diner was set here. Its lyrics are a first-person description of stopping at a diner for coffee and observing the other patrons and the diner's surroundings. Vega's song Tom's Diner was used by Karlheinz Brandenburg to fine-tune the MP3 audio compression algorithm. Contrary to some audio engineering lore, the MP3 codec is not optimized for this song alone. But it was a significant member of a collection of varied audio material. The Cathedral of Saint John the Divine is one block east along 112th, on Amsterdam, and is partly visible here. Tom's Restaurant, Broadway at 112th, and the Cathedral of Saint John the Divine. Tom's Restaurant, Broadway at 112th. 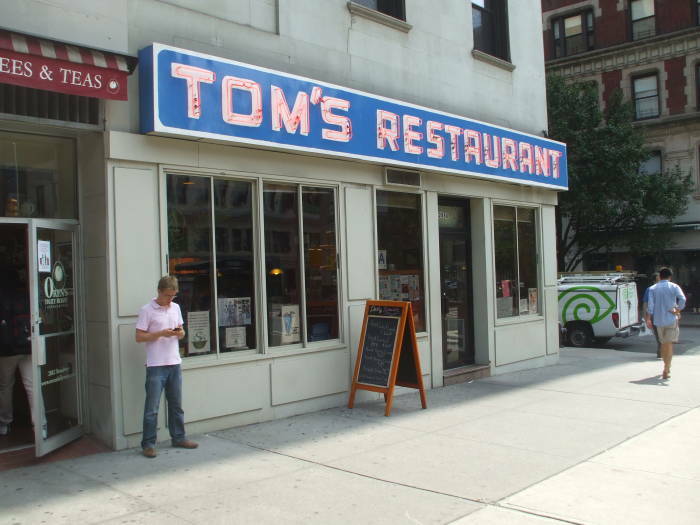 Jerry Seinfeld and his friends frequented Tom's from 1989 through 1998, referring to it as "Monk's Café". Before that, Barack Obama frequently ate at Tom's in the early 1980s. 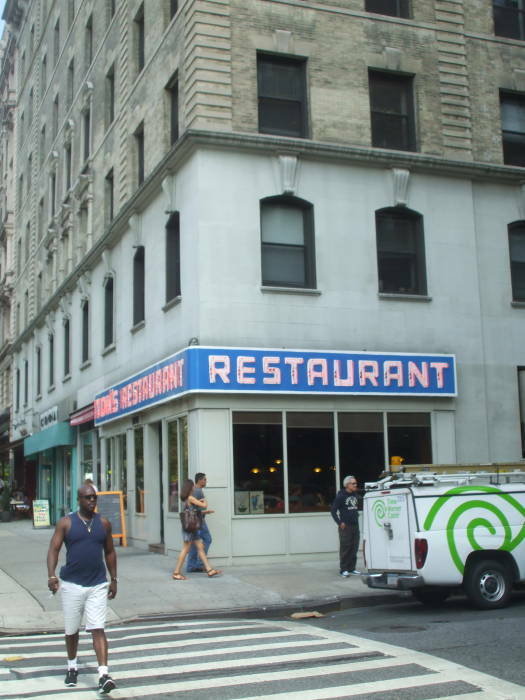 He attended Columbia University, which largely surrounds the diner, in 1981 through 1983. He graduated in 1983 with a Bachelor of Arts, majoring in political science with a specialty in international relations. From there he went to Harvard Law School in Cambridge, Massachusetts. 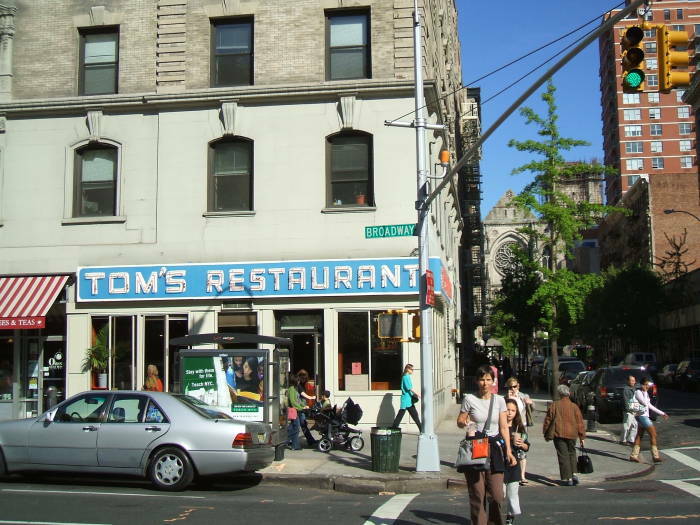 Columbia University owns the building housing Tom's Restaurant. Some of Columbia's programs as well as NASA's Goddard Institute for Space Studies are located upstairs in the six stories above the ground floor. The Goddard Institute for Space Studies is a laboratory of the Goddard Space Flight center and a part of the Earth Institute at Columbia University. Its work focuses on climate change. They study paleogeological data and detailed global data collected from satellites. Low Memorial Library, below, is now the administrative center of the university. Its freestanding granite dome is the largest one in the United States. The dome caps the rotunda, 32 meters high, which was the reading room when this building was the university's main library. The library was designed to incorporate many of the architectural elements of the Panthenon in Rome. The building's plan take the shape of a Greek cross, and the windows are modeled on those in the Baths of Diocletian, the largest of Rome's thermae or public baths, built in 298-306 AD. 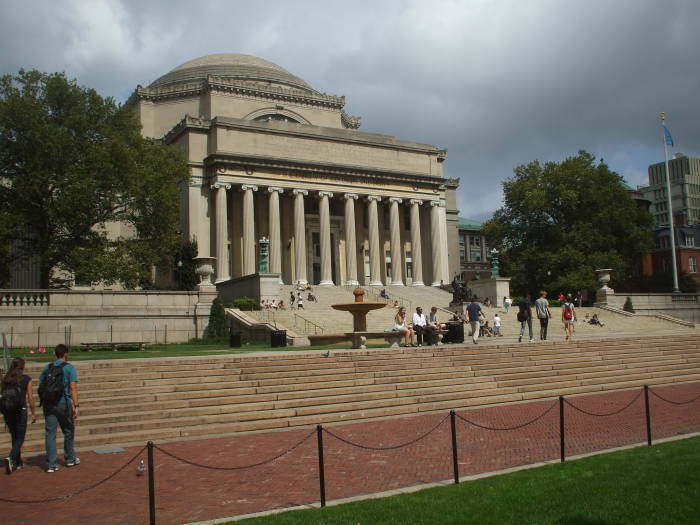 Low Memorial Library and Department of Psychology and Parapsychology, Columbia University. When the library was built on the new Morningside Heights campus in 1895, it was surrounded by crop fields. The university itself had been founded in 1754. 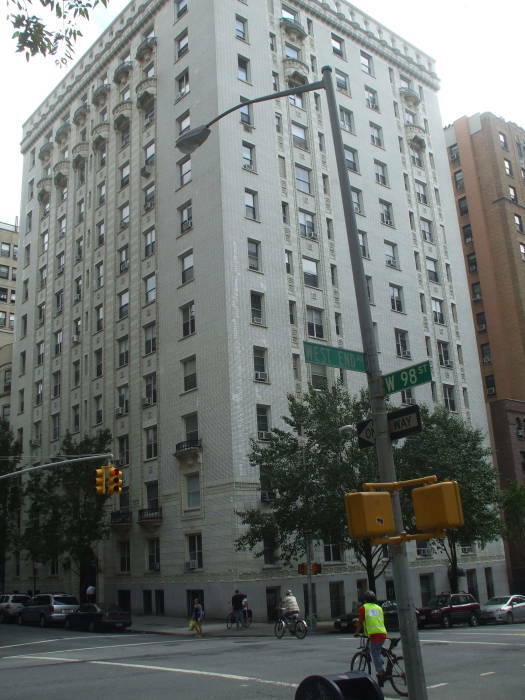 It moved to the new campus from its former location around Madison Avenue and 49th Street. The Department of Psychology and Parapsychology, where Doctors Peter Venkman, Raymond Stantz, and Egon Spengler carried out their research, is off to the right in this view. It's housed in Schermerhorn Hall. Peter Parker's high school science class once visited a genetics research laboratory located in the main rotunda. West End Avenue and West 98th Street. Stanley Martin Lieber, known under his pen name, now legal name, Stan Lee, was born on December 28, 1922, in his parents' apartment at the corner of West End Avenue and West 98th Street. The old neighborhood has changed quite a bit since then. 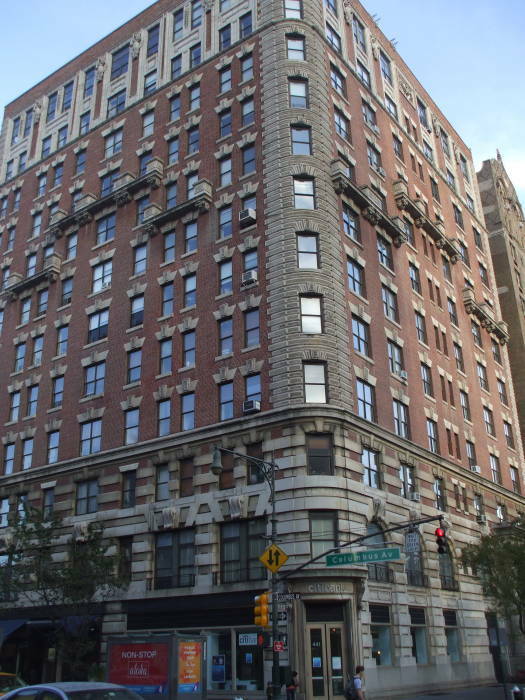 Liz Lemon lives in apartment 3B at 160 Riverside Drive at the corner with West 88th Street. 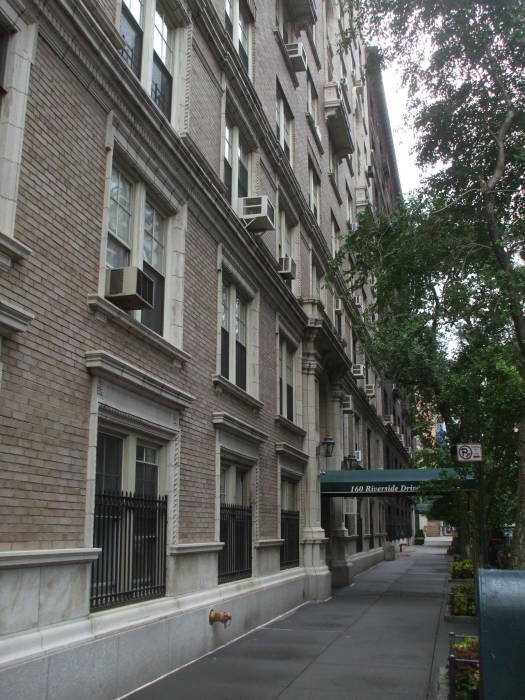 The apartment building's entrance is actually around the corner on West 88th Street. However, as is commonly done in New York, the building at the corner uses an address belonging on the more prominent street. This building is across Riverside from the 1902 Soldiers' and Sailors' Memorial Monument honoring the Union Army servicemen from the Civil War. 160 Riverside Drive, at West 88th Street. 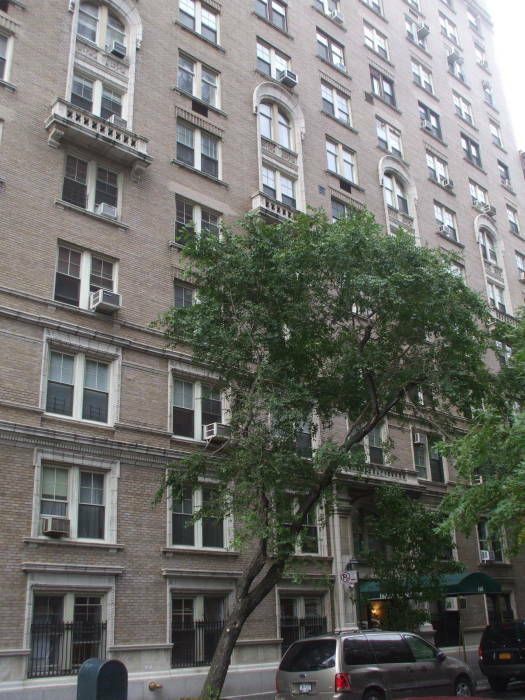 J. Robert Oppenheimer lived directly across 88th street, at 155 Riverside Drive. But this was in 1912 through 1922, when he was 8 through 18 years old. He left in 1922 for a life of science and then persecution by Joe McCarthy. Oppenheimer didn't attend or teach or work at the nearby Columbia University, although it was heavily involved in the physics programs leading to the Manhattan Project, for which Oppenheimer was the scientific leader. Oppenheimer attended Harvard, then did graduate work at Cambridge University at the University of Göttingen. He then did post-graduate work at Caltech and Harvard, then taught at the University of California, Berkeley. At Columbia, a team was investigating gaseous diffusion and centrifugal separation for uranium enrichment by 1941. Harold Urey's group was researching heavy water. In early 1942, groups from Columbia and Princeton moved to the University of Chicago, where they formed the Metallurgical Laboratory and studied plutonium and graphite moderated reactors. Back somewhere near Riverside and 88th, Oscar Madison had a "large eight-room affair on Riverside Drive in the upper eighties". Riverside Drive is a major road running north to south along the west side of Manhattan, from 181st Street near the George Washington Bridge down to 72nd Street. Especially from its south end up to 118th, it is lined with luxury apartment buildings and a few surviving nineteenth-century mansions. 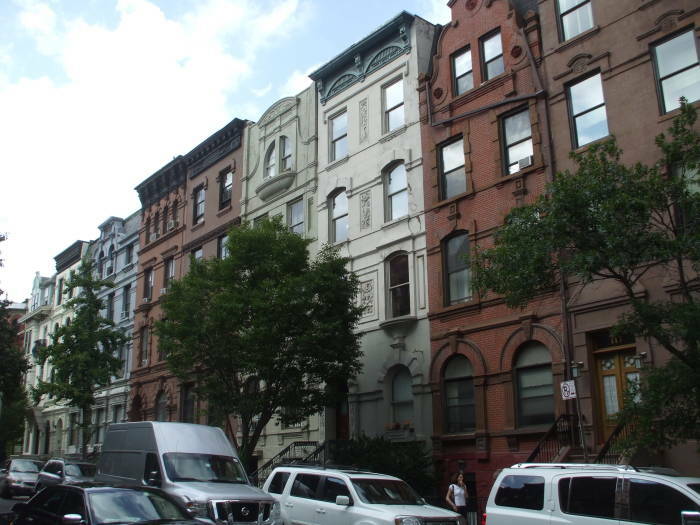 One of those mansions is the Henry Codman Potter house, a 1903 Beaux-Art home just one block north at 89th Street and now the home of Yeshiva Ketana of Manhattan. The drive follows and was designed as a part of Riverside Park, created by Frederick Law Olmsted, who also co-designed Central Park and Prospect Park in New York and many more parks nation-wide. Jerry Seinfeld lived at 129 West 81st Street, between Columbus and Amsterdam Avenues, just a block from the Museum of Natural History. This building, the grey one four windows wide at the center of the picture at right, may not look like you would expect. The building exterior you have seen on TV is stock footage of an apartment complex in Los Angeles. This building, however, is where he lived while becoming a stand-up comic success. The precise address was then incorporated in the show's dialogue. 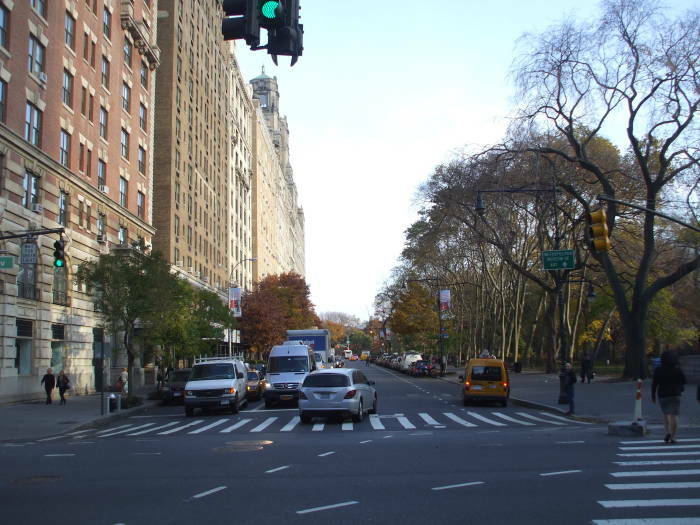 Here you see the view along West 81st, looking west from close to the Columbus Avenue corner. #129 is the seventh building down the right side of the street in this view. Patrick Bateman lives just half a block east in the American Gardens Building at 55 West 81st Street. Yes, the building at the corner of 81st and Columbus Avenue is now numbered #51, and the street numbers jump into the 100s as you cross Columbus, but then Patrick seems to have a somewhat tenuous grip on reality. We're looking east on 81st Street here. The next corner ahead of us is Central Park West, and 81st continues across the park to the Upper West Side. The park at right is the grounds of the American Museum of Natural History, where Neil deGrasse Tyson works. American Gardens Building, Columbus Avenue and West 81st Street. 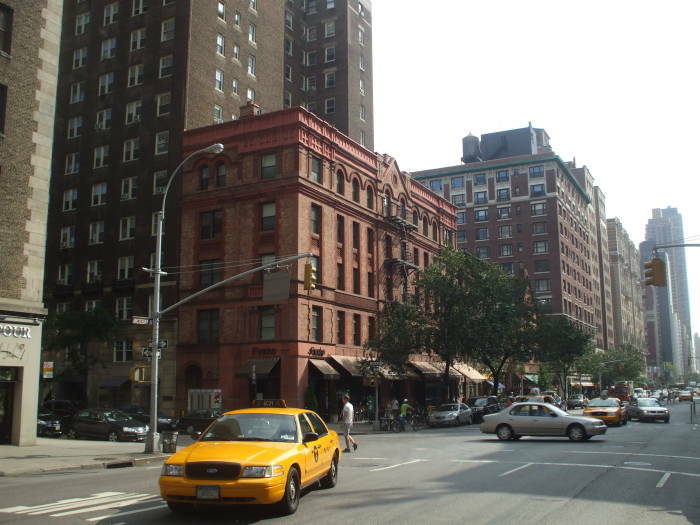 Ted Mosby lived for a while at the corner of Amsterdam Avenue and 75th Street, seen here looking south on Amsterdam. 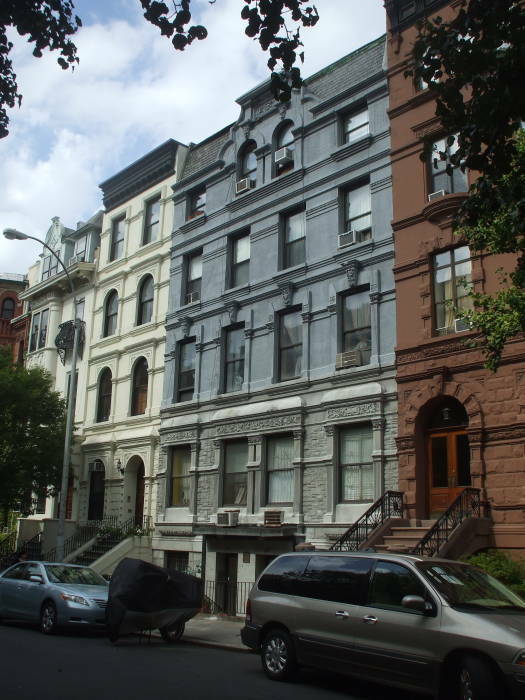 This segment of Amsterdam from 59th Street to 100th Street became one of the city's most expensive residential districts in the late 20th century. Amsterdam is a central section of Tenth Avenue, a major north-south thoroughfare in Manhattan. It runs from Gansevoort Street in the West Village and Meatpacking District all the way up to 218th Street near the northern tip of Manhattan. It's one way south in its southernmost four blocks. It's one way north up uptown from 14th Street to 110th Street. Then it's two-way north from there. Between 59th Street and 110th Street it is called Amsterdam Avenue. There is a short break around Highbridge Park beyond 190th Street. The segment of Tenth Avenue from Highbridge Park down to Gansevoort, 177 blocks, is the longest continuous avenue in Manhattan. 111 Archer Avenue, Convent Avenue at West 144th Street. 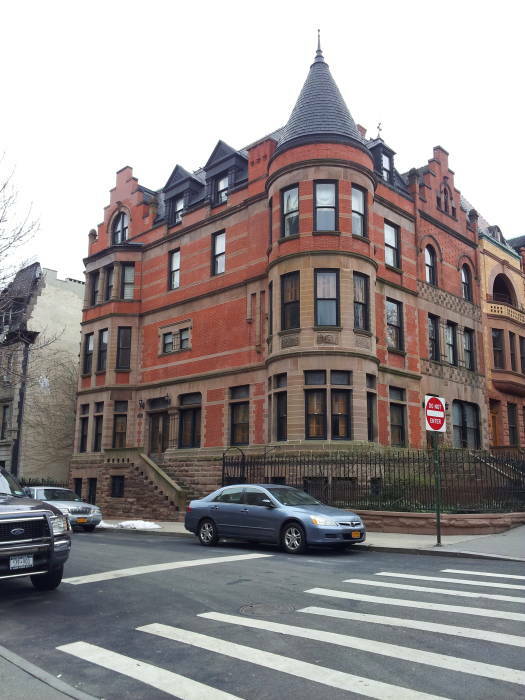 Further north, the Royal Tenenbaum family lives at 111 Archer Avenue, also known as Convent Avenue at 144th Street. Mordecai the hawk screams overhead. Some people don't make it back from the bridge on the wrong type of night, including an MVD organizer, Paula Riis, and Oscar Deamer. However, during the day it can be an interesting walk over to New Jersey and back. 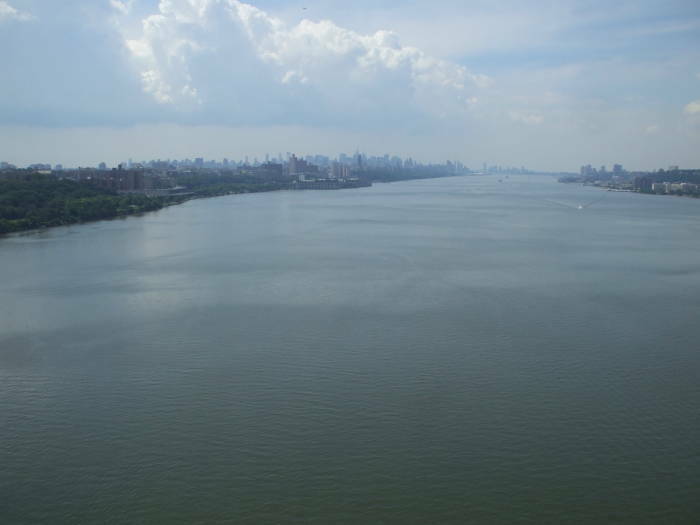 You're looking south down the Hudson River from an elevation of 212 feet above the water mid-span. The towers of Jersey City at right and Midtown and Lower Manhattan at left are visible in the distance, some six to ten miles away. The bridge carries four lanes in each direction on the upper level and three in each on the lower level. 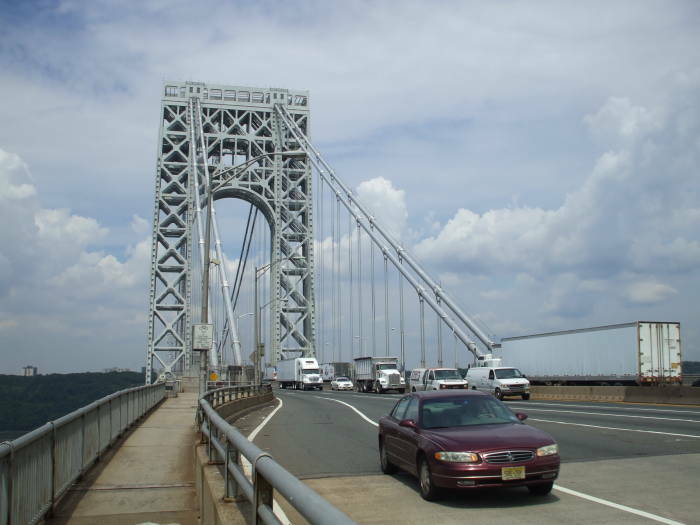 It carries Interstate 95 and U.S. routes 1 and 9, and the approximately 106 million vehicles crossing per year make it the world's busiest motor vehicle bridge. Its main span of 3,500 feet was the longest main span in the world when it opened in 1931, nearly double the previous record of 1,850 feet.